Our Lady of Liesse church, Valletta, built in 1740. Right: The interior of the church. 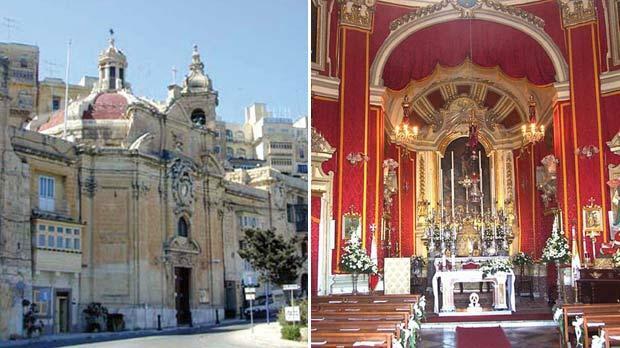 The church dedicated to Our Lady of Liesse is located on the waterfront of the Grand Harbour of Valletta at the end of the street that leads to Victoria Gate. The original structure was built in 1620 at the expense of Fra Giacomo Chenn de Bellay, bailiff of Armenia. The church was completely rebuilt on the same site by the Langue of France, the most important division of the Order of the Knights of Malta, in 1740, as reported by the epigraph engraved on the façade just above the pediment. On November 23, 1806, it was solemnly consecrated by Bishop of Malta Vincenzo Labini. The remains of the martyr St Generoso are preserved in the church. 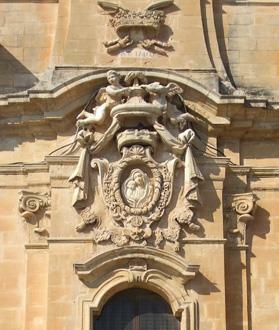 Relief sculpture on the church façade above the main door. The structure has a central plant, surmounted by a lowered dome, covered in red bricks and marked by strips of white stone, ending with a lantern. The façade is marked off by composite engaged pilasters supporting a pediment broken with the curved upper profile. At the centre appears a clypeus depicting the Madonna of Liesse with Child framed by a curtain supported by two angels. To the left of the prospectus stands the only bell tower, created by Francesco Zammit, completed by an elegant cusp. The building was badly damaged by German bombing in 1942, during which the Maltese population took refuge in underground air raid shelters, in part specially excavated and partly already existing, such as St Paul Grotto in Rabat, where the apostle who introduced Christianity in Malta in AD60 took refuge, after the ship on which he was traveling was swept away in a violent storm. After the end of World War II, the building was restored and reopened in 1952. Today the church is managed by the Order of Franciscan Friars Minor and is the seat of the National Centre Apostolate of the Sea. During the Crusades, the Knights of St John were engaged in a bitter struggle against the Muslims in the Holy Land. In 1134, between the first and the second crusade, a fierce battle raged between Christian and Muslim armies in which three noble knights from Picardy distinguished themselves by their courage. The heroic French soldiers, despite their efforts, were captured by the Saracens and were led to Cairo before the caliph, who, having sensed their military valour, tried to convert them to Islam, promising them lavish gifts. The knights, strong in faith as well as in battle, did not yield to blandishments, so they were imprisoned in a tower where they suffered hunger and hardships. Here the caliph sent various religious leaders to try to convert the knights, but every time, they left without success as the knights used persuasive arguments in defence of their religion. Then the stubborn caliph tried one last time: he sent in their cell his daughter Ismeria, a pretty princess in the prime of life, to convert them to the Muslim religion. The girl, moved to pity for the cruel end that awaited the knights if they did not obey the will of her father, tried in every way to persuade the prisoners to change their faith, promising them in return riches and honours. Several times she went to the condemned and every time they revealed to her the Scriptures, until they spoke of the Virgin Mary. They told Ismeria that the Virgin Mary’s “image is enough to enrapture every heart, convincing it to love her”. 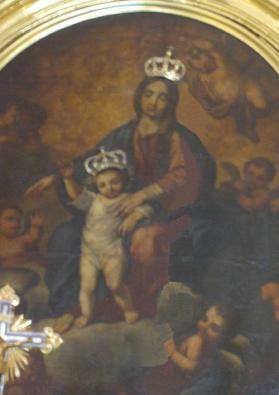 The princess became curious and asked the knights to create an image of the Divine Mother, so that she could see it. She gave them a piece of wood, brushes, and the necessary tools, so that they could create a statue, then she went away. The two younger brothers, in despair, turned to the older one, because they were unable to create such a statue, but he reassured them, exhorting them to pray. They fell into a deep sleep, during which an angel, sent by the Virgin Mary, carved the piece of wood in the form of a very gentle figure of the Madonna. Enveloped in a dazzling light, the knights awoke and knelt down in front of the statue to worship it. 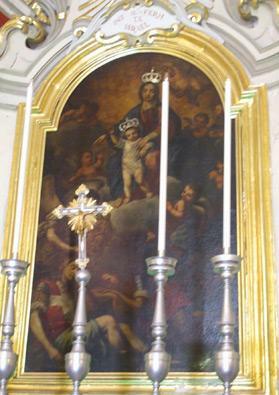 Our Lady of Liesse with Child, the angel and the sleeping knights, an 18th century oil painting by Enrico Arnaux at the church. Morning came. Ismeria arrived to the tower and saw the statue. The knight of Eppe, the eldest of the three brothers, said: “So here is the statue of the Virgin worked by the angels, without human artifice.” The princess fell at the foot of the statue imploring the Virgin Mary to make her Christian through baptism. The following night, the Virgin appeared in a dream to the princess, predicting that she would take her to France, escorted by the three knights, with whom she would have fled from Egypt. During the night, Ismeria rushed to the tower, which she found miraculously open, and she led the knights out of the fortress, giving them back their freedom. As soon as the fugitives arrived on the bank of the Nile, they were unable to reach the opposite shore, when suddenly a friendly boatman led them to the other side, but as soon as they reached their destination the man vanished. He was an angel sent by Our Lady. The four went on their way, until Ismeria, exhausted, asked for a little rest in the shade of a hedge. All of them fell asleep and a new miracle happened: the group woke up in another place. So they asked a pastor in passing where they were and he replied that they were in Picardy, in the land of Leon, and that near there was Eppe’s villa. They knelt down and humbly thanked the Virgin Mary, so they reached a garden where the statue of Our Lady, which they were carrying from Egypt, became so heavy that it could not be moved: it was a clear divine sign that the Virgin wanted to be worshipped in that place. Then, in the village of Liesse, a temple dedicated to Our Lady of joy was built. The knights were greeted with jubilation by their relatives, who never tired of listening to that story of wonders and miracles, and they were also fascinated by princess Ismeria, who in the name of God had renounced her royal life. She was soon conducted to the Bishop of Laon who baptised her by giving her the name of Mary. She led an exemplary life, and at her death was buried in the church that the Virgin had indicated to the fugitives. Five centuries later, the French knights took this devotion to Malta, where they built a church dedicated to Our Lady of Liesse on the waterfront of the Grand Harbour of Valletta, on a pre-existing church. The statue of the Madonna and child carried to France from Egypt was destroyed during the Revolution of 1789. The legend of Ismeria and the three knights is well depicted by the altarpiece, painted in the 17th century by Enrico Arnaux (1692-1764), a Maltese painter not immune to the influence of Mattia Preti, but above all of Stefano Erardi. The painting is divided into two levels: in the upper part, the Madonna and child sit on a throne made of clouds, surrounded by angels, and they watch the scene that takes place at their feet. Below are depicted knights asleep, while on the far left is the angel carrying the statue to be delivered to princess Ismeria, as foretold by the Virgin. The scene is bathed in a suffused golden atmosphere which gives it the character of precious vision. The church of Liesse also contains two paintings by Cassarino, an important follower of Caravaggio, after his escape from Malta: St Maurus healing a child, a work from his mature stage, signed and dated 1623, and St Louis of France, which instead belongs to the first naturalistic phase of the painter. 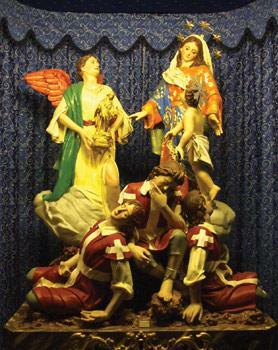 Our Lady of Liesse with Child, the angel and the three knights, a 1981 papier-mache sculpture by Albert Micallef plated in 18-carat gold and oil painted. In front of the sacristy is a papier-mache sculpture, guided in 18-carat gold, painted in oil and created in 1981 by the Maltese sculptor Albert Micallef. The sculptural group consists of six figures: in the upper right is Our Lady, wearing precious garments in bright colours, imparting orders so that the miracle is accomplished, while on the opposite side the angel, holding the statue intended for princess Ismeria, looking at the Virgin, fulfilling her instructions. On the far right, the child Jesus points downward to the three knights sleeping, forming a bridge between the divine world and the human, between the miracle that has just happened and the knights’ state of unconsciousness. The three sleeping soldiers form a tight pyramidal group, whose apex is occupied by the knight of Eppe. The sculpture was restored in 2011. The statue is brought out of the church and carried on the shoulders of the faithful during the feast day of Our Lady of Liesse, which takes place on April 30. The author thanks Fr Joe Borg, rector of Our Lady of Liesse church and Maltese sculptor Albert Micallef for their kindness and information.